Topaz Mountain is one of the world's great places to find topaz, a semiprecious gemstone that occurs as hard transparent crystals, in a variety of shades. Topaz Mountain is composed of a volcanic rock known as rhyolite. Topaz crystals formed in cavities in the rhyolite. When first uncovered it is amber in color, but it quickly turns clear when exposed to sunlight. The crystals at right are shown as they appear when found, mostly encased in mineral. Those in the pano above have been cleaned up. 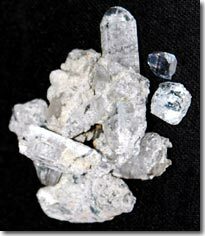 If you search the washes and slopes on the south side of the mountain you will find small topaz crystals glimmering in the sunlight. If you search seams in the rhyolite, you may find gem-quality crystals. Topaz Mountain is located in a remote area where there is no water and no services are provided. When traveling to such areas, always carry food, water, tools and emergency equipment. To get there from Nephi, travel southwest on Hwy 132 for about 34 miles to the town of Lynndyl and the junction with Hwy 6. Continue south on U.S. Highway 6 for about 5 miles and then turn west onto the signed Brush Wellman Road. Drive northwest on the paved Brush Wellman Road for about 37 miles, to the signed dirt road leading up to Topaz Mountain. The mountain will be clearly visible at this point. The most popular rockhounding spots are along the mountain's southern slope.